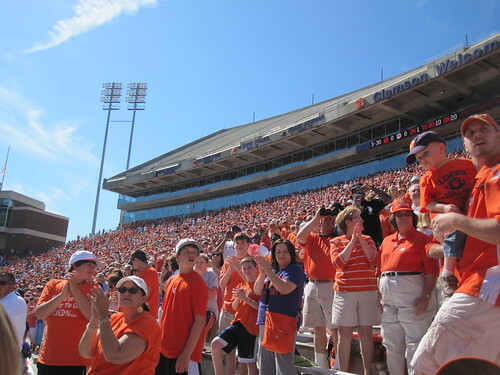 This weekend will be the annual Clemson Spring Orange & White game. Admission and parking are free, so if you don't yet have weekend plans, I highly recommend you go. It's a great weekend full of events (in addition to checking out this year's football team), and it's a great way to spend a weekend with your family in Clemson without the massive crowds, traffic, outrageous hotel prices, etc. The weather is going to be perfect Spring weather! There are a number of events taking place this weekend in Clemson, in addition to the Spring game, that you and your family can take part in. 10:00 AM - until - Clemson Literary Festival - book fairs, readings, live music, etc. 7:00 PM - Christopher Branch concert @ the Amphitheater (admission is FREE) - "A powerhouse singer/songwriter who takes his cues from his South Carolina forerunners Edwin McCain & Hootie & the Blowfish, but also lets his own simplistic, unique songwriting shine through..."
NOON - 4:00 PM - International Food Festival @ Bowman Field - "Come out and experience a smorgasbord of food and live entertainment from all around the world provided by Clemson's nearly 1,200 students from 92 countries." It's hard to believe the Spring game is already here...which means that football season is right around the corner. If you've never been to an Orange & White game before, take advantage of a beautiful weather weekend and go. Let's show our Tigers that we support them year round!